Ada Lovelace was one of the influential mathematicians and English writers of her time. She has written instructions for the first computer program in the mid 1800s. She also wrote the program for Charles Babbage’s mechanical computer, the analytical engine. She was born on December 10, 1815 to the poet Lord Byron and Anne Isabella Milbanke. She was also the only legitimate child of her father but had no relationship with her father. Lord Byron left his wife and daughter continuing his affair with a stage actress and died when Ada was just nine years old. Ada Lovelace is credited with writing the first algorithm that was meant to be processed by a machine. She was the first one to realize that a computer would be able to do more than just performing mathematical calculations. She conceptualized a flying machine after studying the anatomy of birds at the age of 12 years. Her mother Anne Isabella Milbanke was also a mathematics wiz. She was also known as the Princess of Parallelograms. Ada married William King-Noel, the first Earl of Lovelace. She is also known as the ‘Countess of Computing’. 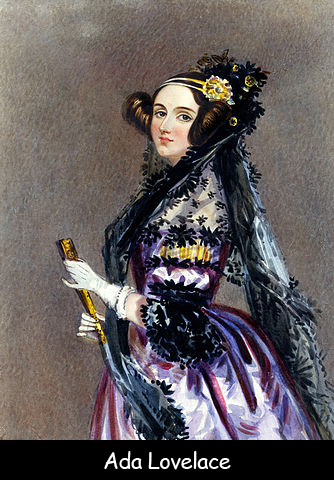 There is also a computer programming language which is named in Ada Lovelace’s honour. It was developed during the 1970s by the U.S. Department of Defense. Lovelace died on November 27, 1852 due to uterine cancer. She was 36 years old at that time. She was buried next to her father at her request who also passed away at the age of 36 years. Declan, Tobin. " Amazing Facts for Kids about Ada Lovelace ." Easy Science for Kids, Apr 2019. Web. 18 Apr 2019. < https://easyscienceforkids.com/ada-lovelace/ >.